The Rebel Sweetheart. : Spotlight | NeoCell Skincare Products + Giveaway! A few months ago, I had the privilege of trying out some of NeoCell's best-selling products - the Beauty Bursts and the Keratin Hair Volumizer. Using them for weeks led to amazing results, hence I grew really fond of the brand. And so when NeoCell sent me a second wave of their new products, I was more than thrilled, and ready to be impressed all over again. Today I'll be doing a capsule review of these three products - the Alpha Cell Exfoliator, the Hydra+ H.A. Serum, and the Refreshing Herbal Mist. I've been using all three for more than a month now, and I must say, NeoCell does exactly what it says it can do for your skin. L-R: Alpha Cell Exfoliator, Hydra+ H.A. Serum, Refreshing Herbal Mist. Made with natural fruit extracts, the Alpha Cell Exfoliator removes dead skin cells on the surface to make the skin look fresh and radiant. It contains green tea, a product that is rich in anti-oxidants, and has anti-aging and anti-inflammatory properties. To use, simply pour a moderate amount on a cotton ball, and apply it on clean, dry skin while avoiding the eye area. I use this every morning, before applying moisturizer on my face. Clear liquid, comes in a clear plastic bottle. I love how this product penetrates easily, and how it makes my skin bright and tight sans the redness and irritation. For those who detest heavily-scented skincare products, you'll like how this product has no scent at all, although I was kinda hoping for it to smell like green tea or something. The Hydra+ H.A. Serum, on the other hand, is a 'penetrating time-release serum' that contains natural hyaluronic acid (H.A.). Hyaluronic acid plays a critical role in skin health with its unique ability to hold in moisture. When applied topically, hyaluronic acid forms an air permeable layer and penetrates into the dermis, thus boosting the elasticity and hydration of the skin. The protective barrier on the skin locks in moisture, which gives the skin a youthful appearance. NeoCell's Hydra+ H.A. Serum does exactly that - it makes the skin glowing, plump, and youthful-looking. My skin felt tight right after the first application, and with continued use, the fine lines under my eyes started to fade away. This product has a nice, citrus scent - subtle and not overpowering at all. It comes in a pump bottle, which dispenses the product easily and hygienically. Finally, there's the Refreshing Herbal Mist, NeoCell's 'on-the-go moisture complex'. This cooling mist contains collagen, skin balancing herbs, and soothing aloe vera that makes the skin hydrated and revitalized. It comes in a handy 30 mL spray bottle that fits even in my smallest purse. I love that I can take this product wherever I go, and use it whenever my skin needs a little 'pick-me-up' - especially on days when I'm busy running errands while going to and fro my son's school. These NeoCell products are available on iHerb, and at retail stores such as GNC, Whole Foods, and Better Health. Here in the Philippines, NeoCell products are distributed by Power and Beauty. You can make a purchase through their website, or at their physical store located at Trinoma Mall, Level 1. 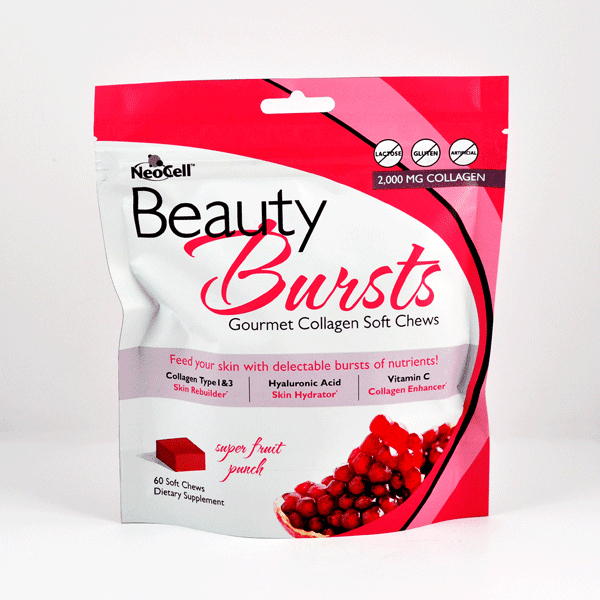 Beauty Bursts in Super Fruit Punch flavor. Once again, I will be using Rafflecopter for this giveaway. The rules are simple - complete ALL of the mandatory tasks for your entries to be valid. You can earn more entries by doing the optional tasks. Giveaway will run until August 21st and is open worldwide. I haven't heard about this yet, but I like the natural fruit extract ingredients. :) Lucky whoever wins the giveaway! The Sun and pool chlorine is really taking a toll on my skin this summer! I need to check into neo-cell! I never heard of this product, I'd like to give it a try though. This looks like something my son uses.. it seems to work pretty well. thanks for the giveaway. Wow, they have skin care products din pala. Since you said effective yung chews, I'm sure the line is effective too. I'm interested sa serum since it's easily absorbed by the skin. I'd love to try that cell exfoliator! God knows I definitely need it now more than ever. Pls be mine...pls pls pls. Hoping to win this giveaway!